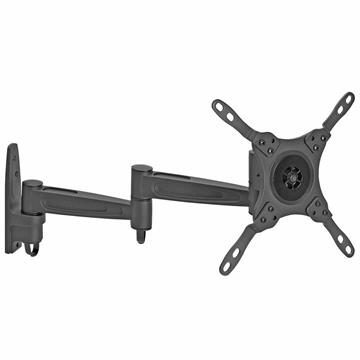 Samsung TV wall mount kit for 17”-75” displays. Choose a model with a swivel arm for full motion control. Vertical tilt and built-in screen levelers are also found in certain TV mounts. Works with Samsung TVs that are 17, 19, 21, 23, 25, 27, 32, 37, 42, 46, 48, 49, 50, 52, 58, 60, 63, 65, 75 inches in size.